Home Styles Biscayne Arm Chair is constructed of cast aluminum with a White finish. Features include powder coat finish sealed with a clear coat to protect finish, and nylon glides on all legs. Chairs are packed two per carton. Item Size: 22.83w 21.65d 32.68h Seat height 15.5h. Stainless steel hardware. 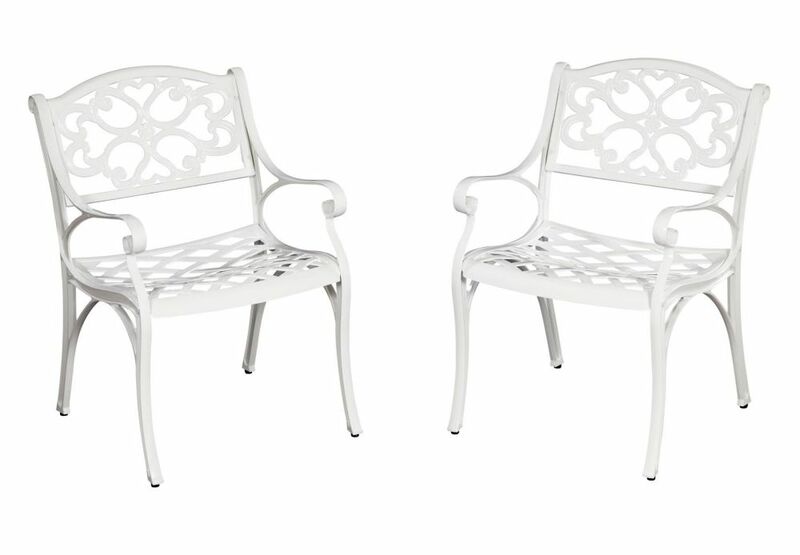 Patio Arm Chair in White (Set of 2) Home Styles Biscayne Arm Chair is constructed of cast aluminum with a White finish. Features include powder coat finish sealed with a clear coat to protect finish, and nylon glides on all legs. Chairs are packed two per carton. Item Size: 22.83w 21.65d 32.68h Seat height 15.5h. Stainless steel hardware. Patio Arm Chair in White (Set of 2) is rated 4.0 out of 5 by 1. Rated 4 out of 5 by HomeDepotCustomer from Easy to put together. Sturdy. Wish it were in... Easy to put together. Sturdy. Wish it were in stock again so I can order more chairs.